Ian Parker has been a leading light in the fields of critical and discursive psychology for over 25 years. The Psychology After Critique series brings together for the first time his most important papers. Each volume in the series has been prepared by Ian Parker, and presents a newly written introduction and focused overview of a key topic area. What is ‘deconstruction’ and how does it apply to psychology? How does deconstruction radicalize social constructionist approaches in psychology? What is the future for radical conceptual and empirical research? The book provides a clear account of deconstruction, and the different varieties of this approach at work inside and outside the discipline of psychology. In the opening chapters Parker describes the challenge to underlying assumptions of ‘neutrality’ or ‘objectivity’ within psychology that deconstruction poses, and its implications for three key concepts: humanism, interpretation and reflexivity. Subsequent chapters introduce several lines of debate, and discuss their relation to mainstream axioms such as ‘psychopathology’, ‘diagnosis’ and ‘psychotherapy’, and alternative approaches like qualitative research, humanistic psychology and discourse analysis. Together, the chapters in this book show how, via a process of ‘erasure’, deconstructive approaches question fundamental assumptions made about language and reality, the self and the social world. By demonstrating the application of deconstruction to different areas of psychology, it also seeks to provide a ‘social reconstruction’ of psychological research. 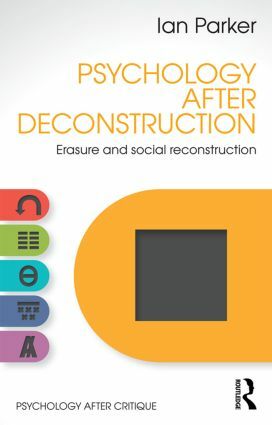 Psychology After Deconstruction is essential reading for students and researchers in psychology, sociology, social anthropology and cultural studies, and for discourse analysts of different traditions. It will also introduce key ideas and debates within deconstruction to undergraduates and postgraduate students across the social sciences.